This species is a reliable flowerer with very long lasting flowers. This species is small warm growing and has been listed as a new species Dendrobium tanii by some authorities but is generally considered a variety of Dendrobium bracteosum. 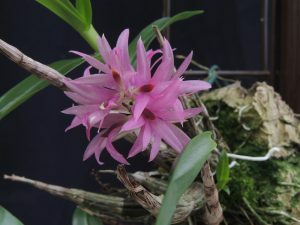 Dendrobium bracteosum var tanii is a much more compact grower than other varieties of Dendrobium bracteosum and appears to be found only on the Maluku (Mollucas) Islands of Indonesia. It is found in a wide range of colour forms and ours start out deep pink and fade to light pink with age. The species is restricted to lowland forests and mangrove and so it enjoys warm temperatures in our Warm Asia section. We grow the species mounted and each year it produces longer bulbs and so we are looking forward to seeing its full potential in the future. It repeat flowers from older bulbs that have lost their leaves and the flowers are very long lived.